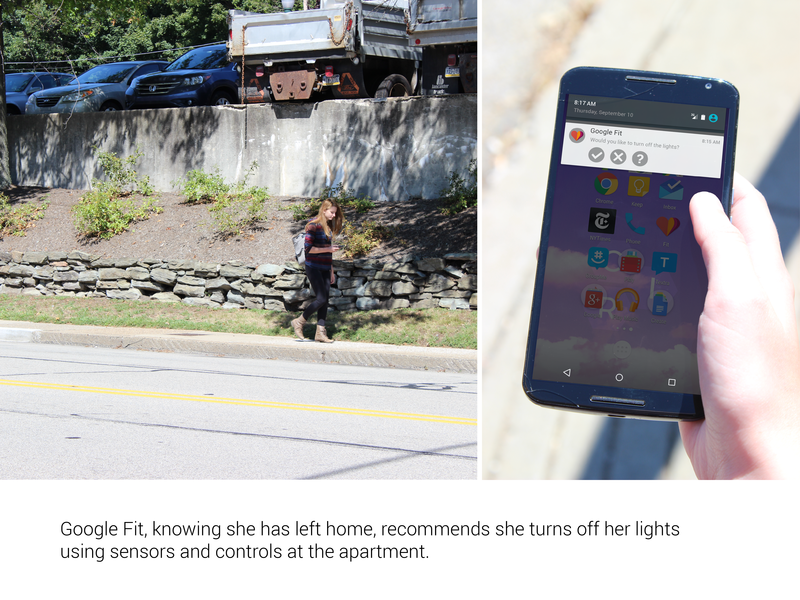 This project honed an acute sense to and taught the ability to mold digital and material worlds through use of existing sensors and cloud technology. Over this app development, I certainly learned some concrete things. First, the importance of accomplishing the correct level of fidelity in a given iteration is integral in fostering the right environment for the level of critique you want. For instance, early on in the iteratitive process, it is best to display loose and quick drawings to show the loose and quick nature of the represented ideas. Similarly, I learned that presenting work for critique is a performance, and the attitude of the performance dictates the attitude of the advice I receive. It also happens to be a performance I could bear rehearsing. I learned how to increase and decrease the scope of an app, and maneuver within or around the walled garden of app compartmentalization. I learned when to be broad and accept critique, and when to be firm and commit to ideas. As my app proposal underwent several modifications between iterations, effectively planning was essential. Time management is easier these days after a year of similar schoolwork hours, but effective use of committed time is a different beast. Over the past couple of weeks I’ve more identified the problem of unproductive work time rather fixing it, but regardless, I suppose that is the first step. I’ll definitely look to reduce the hours I’m working, or make more progress in the current time slots, by reducing distractions. Working outside of studio or with headphones on seems to help, as does disconnecting myself from the internet and cell service. More specifically to the context of this project, I would next time make a point in talking with a professor earlier on. Perhaps that would have saved me some time in the in-between iterations by clarifying the ideal scope of influence of the app. Emotionally, this project was a dream. I’ve still got a little post-summer excitement about getting back to school, and it feels so good to put that much effort into a self-improvement project again. Motivation was no problem either, likely due to this high-energy month of getting back to school. I hope to capture this sensation and spread it over the semester, but if that doesn’t work out, I’m sure working more efficiently will prevent me from burning out. 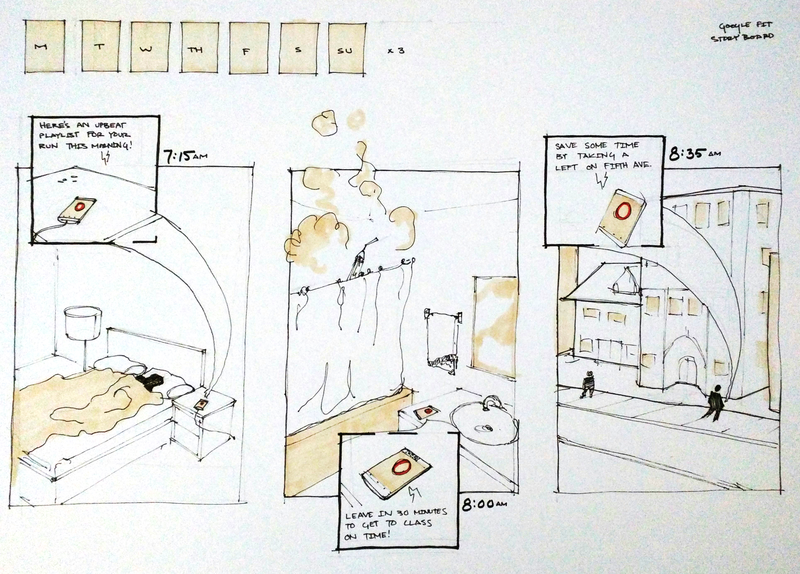 The project is over, and I still can’t quite explain the prompt, so this is an area I’d say I’m still challenged by. Misunderstanding the scope and scale of the project lowered the quality of my final piece because I wasted valuable iteration time in the beginning testing the boundaries of the assignment. 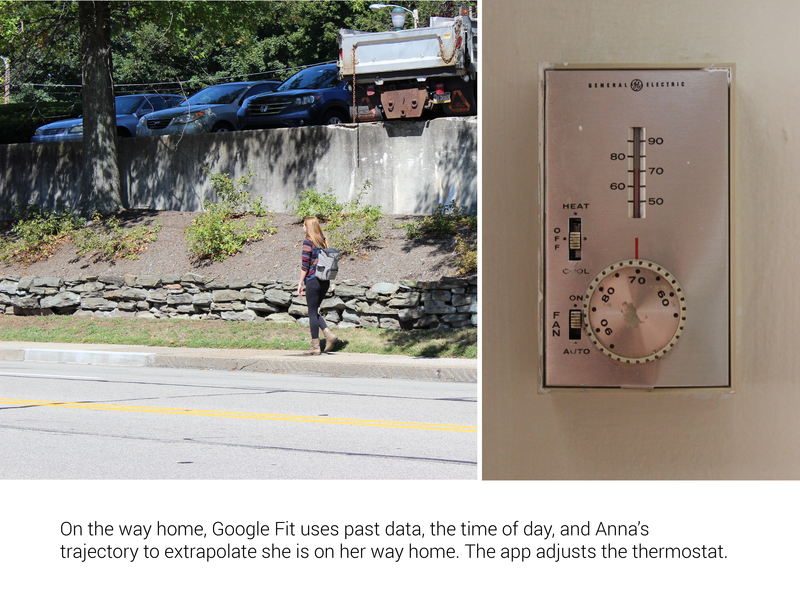 I’ve also been challenged by connecting the physical and digital worlds, though that may be derivative of the passive nature of my chosen app (Google Fit), where the connection was less apparent and integral. 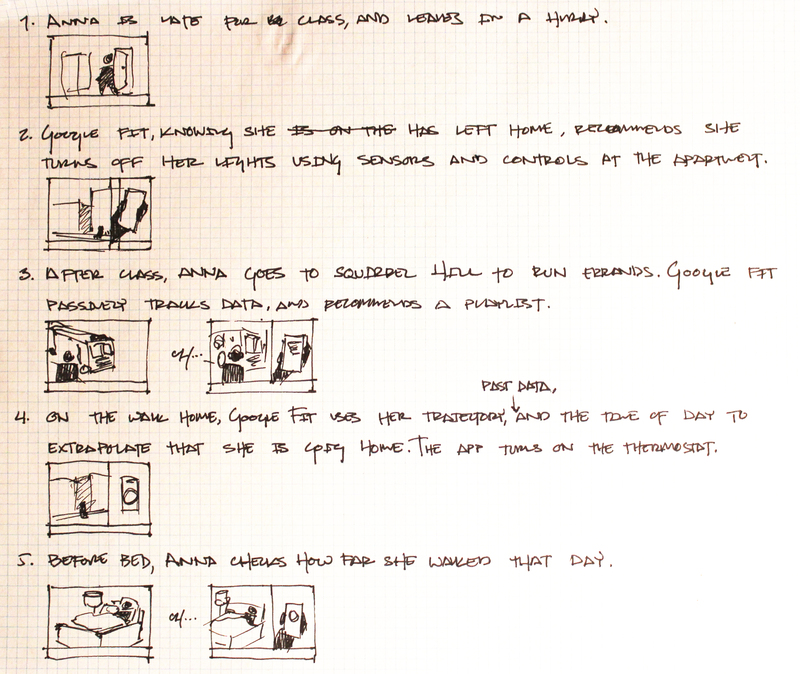 Storyboarding helped me show the different uses of the app in different real world contexts. 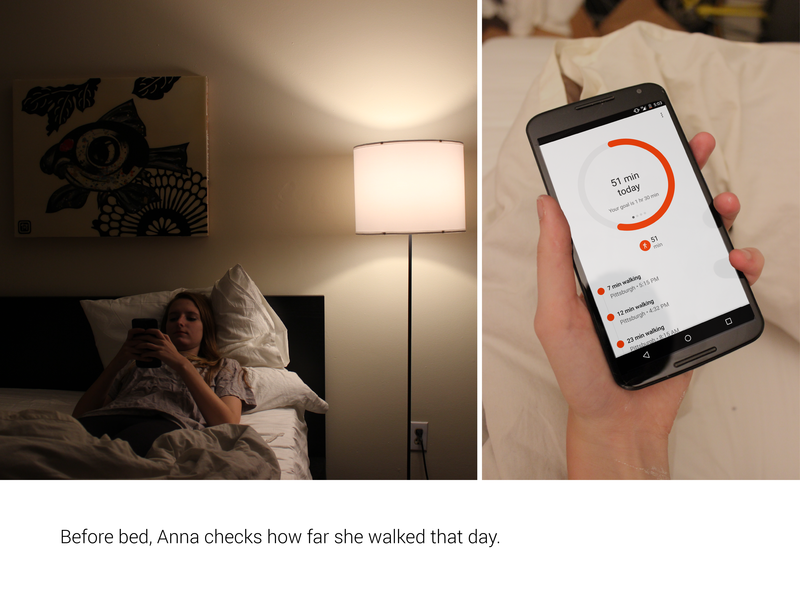 In these frames I attempt to depict Google Fit as a more up-front app, actively communicating with the user instead of passively collecting data and waiting for attention. The app uses the information and pattern recognition it already collects to aid the user through helpful bits of information, including information from other apps like music and weather. where to limit the app; where do I want this experience to fall between a totally passive data collection and a Her-like omnipotent OS? 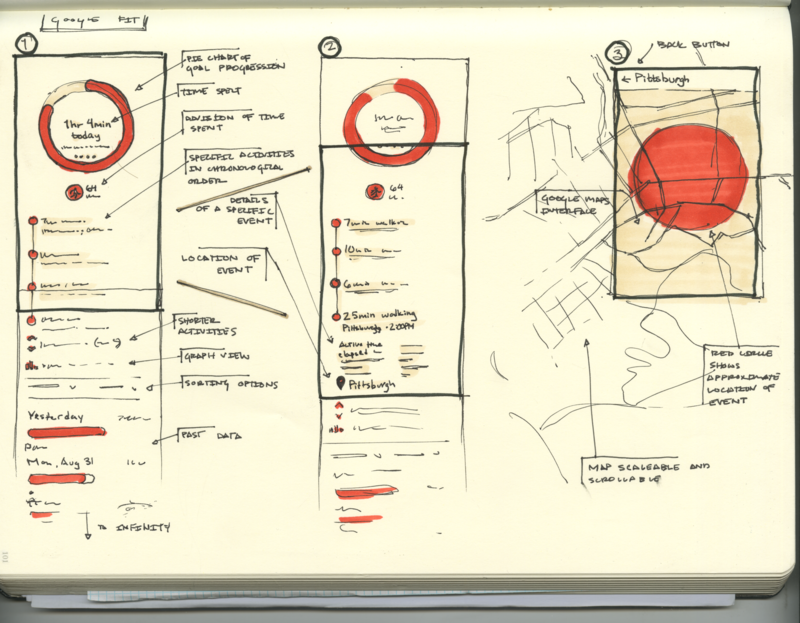 What are the interactions, and media of interactions, between the app and the user? 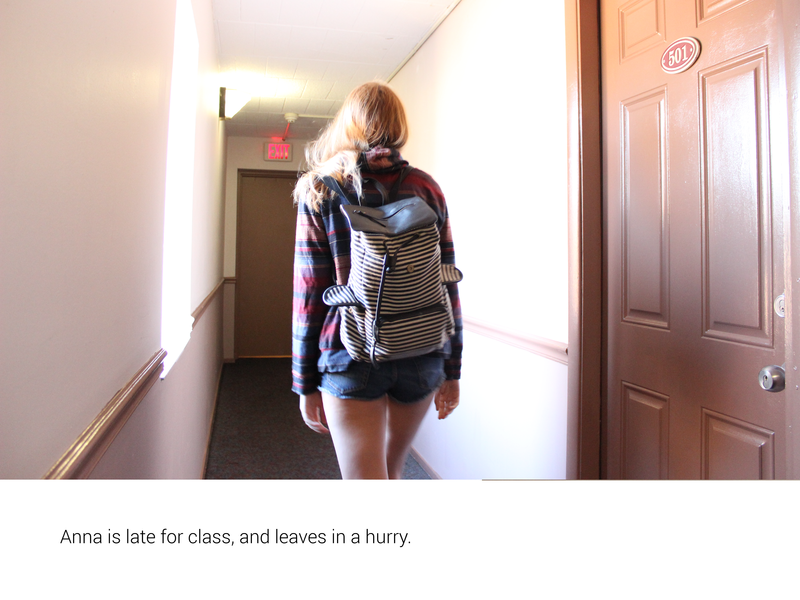 Where is the line between active and intrusive? How does the app change its behavior (if it has behavior) over the course of a day? week? season? From this critique, I gathered the importance of connecting this app with a person’s tendencies. While well-designed, the scope of influence this app provides is small. Currently it is reactive to a user’s habits, providing data after the fact. 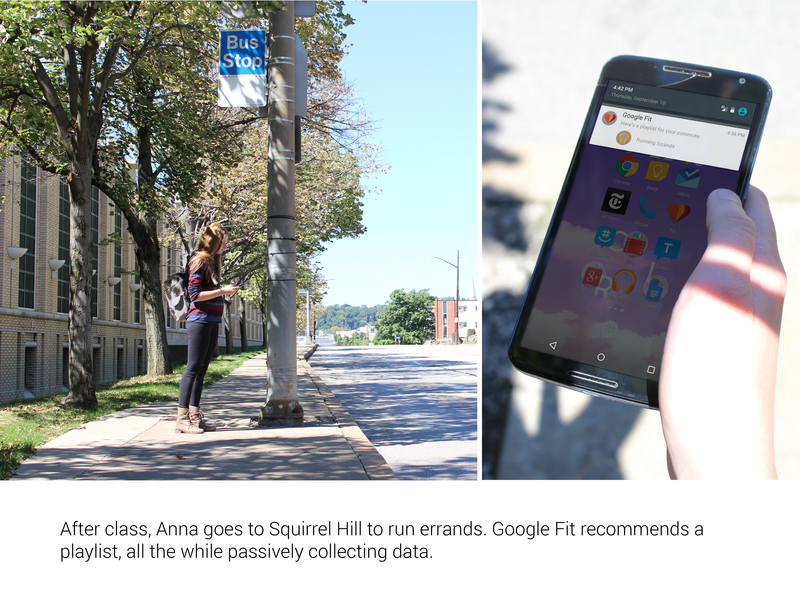 I imagine Google Fit can use the information it gathers to learn the user’s habits and predict typical workout times, destinations, and commutes to more positively influence a user. With this new knowledge, the app can recommend playlists before I exercise, tell me arrival times before I walk to class, and the most efficient routes before I leave home.